Sta Rite catalog # DMJ3-172, Self Priming Centrifugal Pump and Motor assembly, Medium Head, c/w 5 Horsepower, Three Phase, Electric Motor. Features • Both high head and medium head models offer heavyduty motors, easy service design, and air volume control tapping. • Easy Serviceability Normal wearing parts are easily accessible for service and replacement, without disturbing piping and mounting. 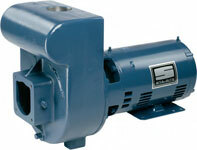 • Heavyduty Motors Designed for continuous operation. Capacitor start, will not cause electrical interference with TV or other appliances. Nationally known motors have ball bearing, stainless steel shaft. For single and threephase operation, 3450 RPM. • Drain Port Provided for easy winterizing. Applications • Lawn Sprinkling operate from 1 to 30 or more heads. Can be safely operated by timer or other automatic device. • Contractors for dewatering excavation, jetting, water transfer and supply operations. • Agriculture seed bed and plot irrigation, stock watering, fire protection. • Industrial sump drainage, fire protection, marine pumping, liquid transfer and supply operations.